From beginning to end, even without the promise of getting the job, your staff went above and beyond the call of duty and worked with us to build the proper infrastructure. They meet with us on numerous occasions to ensure that at the end of the day, the Basketball Facility would be a success. OFI greatly enhanced our new Law Enforcement Center. Their process was smooth and thorough, from recommendations to installations to following up visits. We were immediately impressed with the quality of furnishings thought our facility. OFI did an excellent job. With our project on a fast track, we didn't just need a vendor, we needed a partner who was going to add value to the process; and OFI was a terrific partner. Their collaborative style, creativity, responsiveness, and absolute commitment to client service were instrumental to our project success. OFI was responsive to questions and concerns and guided us through an enormous move in flawless manner. Since our move into our new headquarters, OFI continues to swiftly respond to requests and makes recommendations to address our needs as we fill in to our new space. Kurt Barwis, President Bristol Hospital, Inc.
OFI was a key role and partner to both owners and other consultants who worked on HHC Executive Offices in Hartford and System Support Offices in Newington. OFI went above and beyond to get the project done on a tight timeline and very streamlined budget. Their creativity and commitment to relationships were instrumental in making both projects successful. They have expertise and national connections, with a local flavor of the company next door. OFI has been a partner in our firm’s headquarters relocation efforts twice during the past 10 years, as well as assisting with our branch office expansions. We have learned that we can count on them for timely delivery and installation and quality workmanship…never a detail missed! They’ve always taken the initiative and are committed to get it right the first time. Pure joy to work with and have always exceeded our expectations! OFI is at the top of my list for the services provided. The staff offer much more than just a “nice” experience—they are professional in every aspect—and I look forward to future opportunities to work with this wonderful group of people. There is no comparison to other vendors, in my opinion. Working with OFI has been a very positive experience for HSB. OFI takes customer service very seriously, which is highly important to running our business. Excellent. The customer service continued to be very high AFTER order was placed. Not always the norm. OFI team was flexible with our design changes and questions and timeframes for meeting our expenditure requirements. Recommendations on products, color and layout were very helpful. You have proven to be a partner—critical to a nonprofit organization. 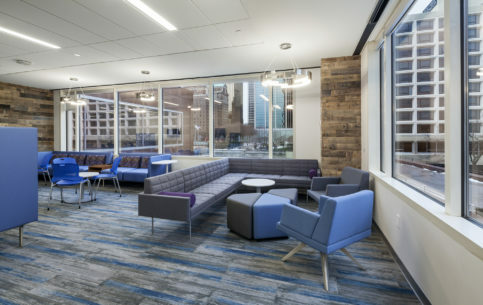 My on-site facilities team in Atlanta RAVED about the quality of the delivery and installation team - but, as they say, the proof is in the pudding - or in this case, the lack of a single item on the Furniture Punch List! How often can that be done? !